Dear adventurers, welcome to Lanzarote! As an island, this little piece of land is surrounded by beaches in every direction. It could be said that one of the main reasons visitors come here is to enjoy the sun and the beaches. It is not always easy to decide which beaches to visit, and a quick look at our directory of beaches will illustrate the variety of beaches, since they come in all shapes and colours. 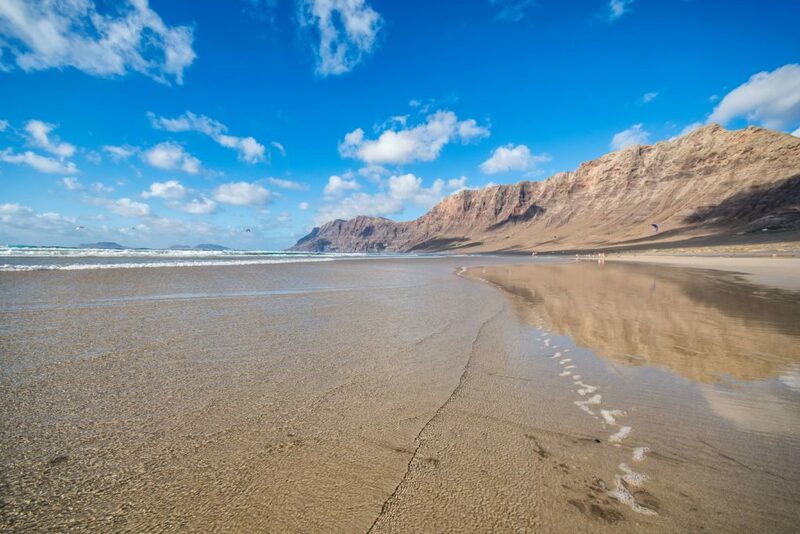 This wide beach of toasted sand is located in the northern part of Lanzarote. Its 6,000 metres of beach start from the village of Caleta de Famara, and end at the feet of the impressive cliffs of the same name. The beach offers an impressive landscape that is completely natural and wild. Part of the Chinijo archipelago can be seen from the shore. And given the variety of its natural, rocky, sandy landscape, it is a great place to walk at low tide. 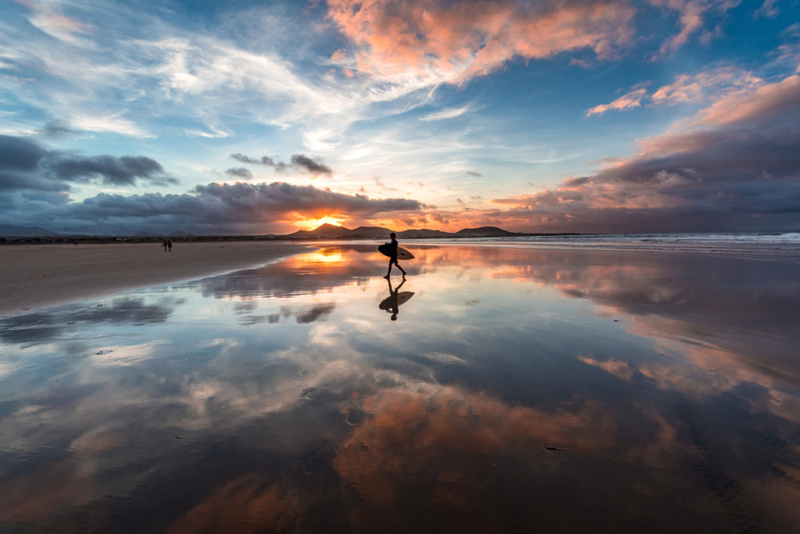 What’s more, in good weather the sunsets are a wonderful spectacle of glinting light and reflections on the wet sand. 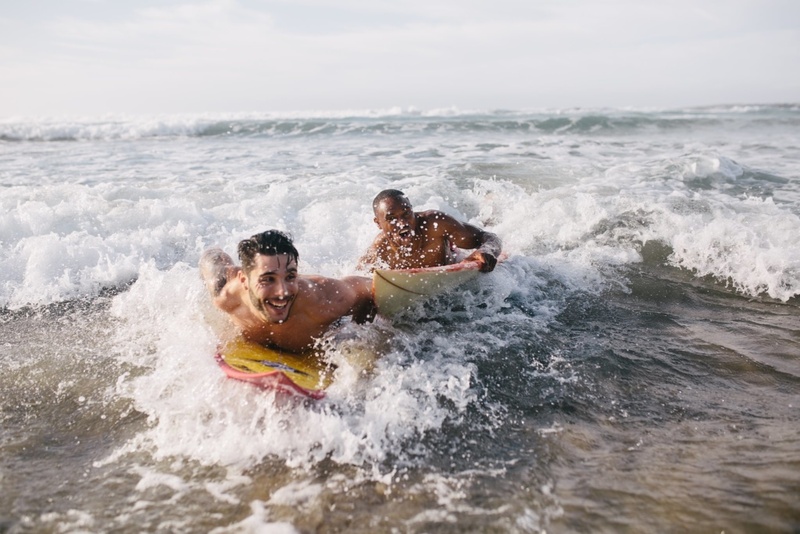 Year round strong waves have led to it being in demand for the practice of water sports like surfing, kitesurfing, windsurfing, stand up paddleboarding, skimboarding, etc.  In the town itself you will find an infinite number of shops and schools that can equip you to practise any of these sports. The beach is very easy to access, although it doesn’t have any infrastructure for people with reduced mobility. However, along almost the entire beach parking is available just a few metres from the sand. 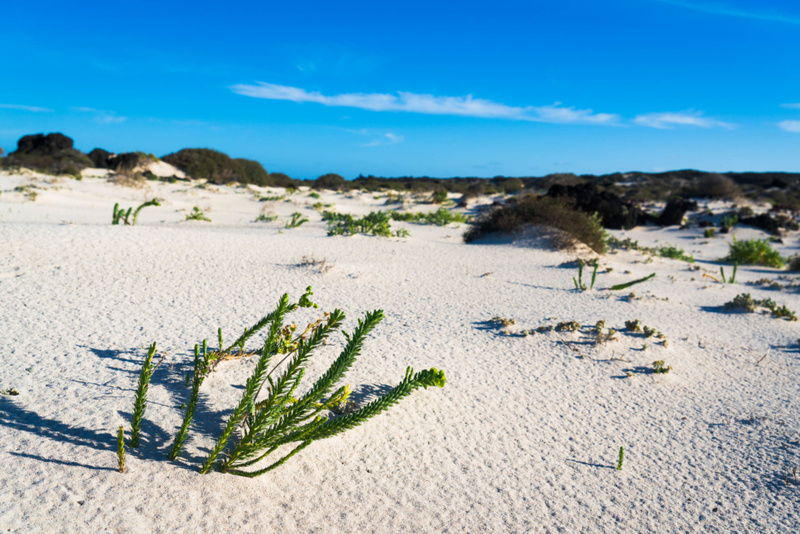 The landscape that surrounds it is made up of dunes covered with scarce vegetation that struggles to grow in this wild location of sand and ocean winds, inviting the visitor to stop and enjoy this fantastic wild location to the full. 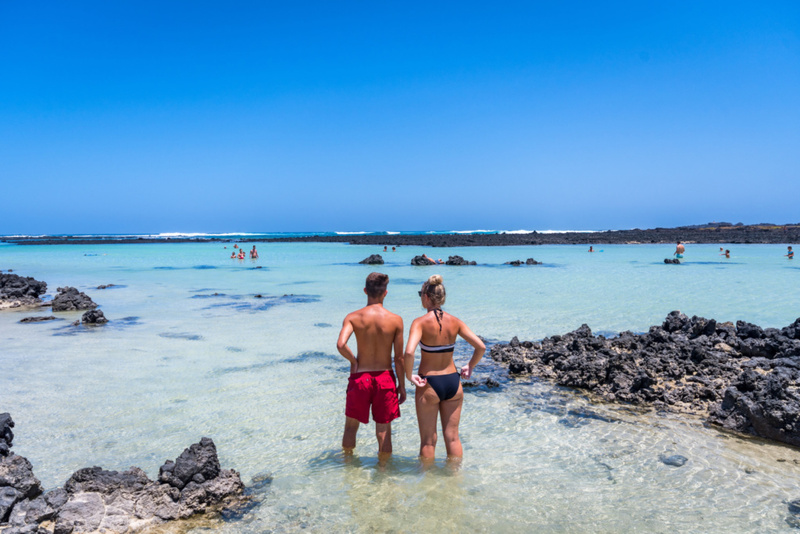 In the northeastern part of the island of Lanzarote is the beach of “calentó blanco”, with inlets of crystalline waters that penetrate into the remnants of the lava flows from the Corona volcano, creating spectacular surroundings. For the traveller’s enjoyment, this beach is covered with fine white sand, and this produces a surprising visual effect on the water, contrasting with the lava flows and creating a work of art. Given the tranquility of its waters, this is a perfect beach to enjoy with your family, or for sunbathing. The calm breathed here is a result of the volcanic landscape, with its abstract and disordered shapes that separate the beaches from the few signs of civilization present in the surroundings. This is a unique space where children and adults can play and explore the surroundings, appreciating how the local flora and fauna live in harmony in this wild place. Caletón Blanco has parking and is easy to access. 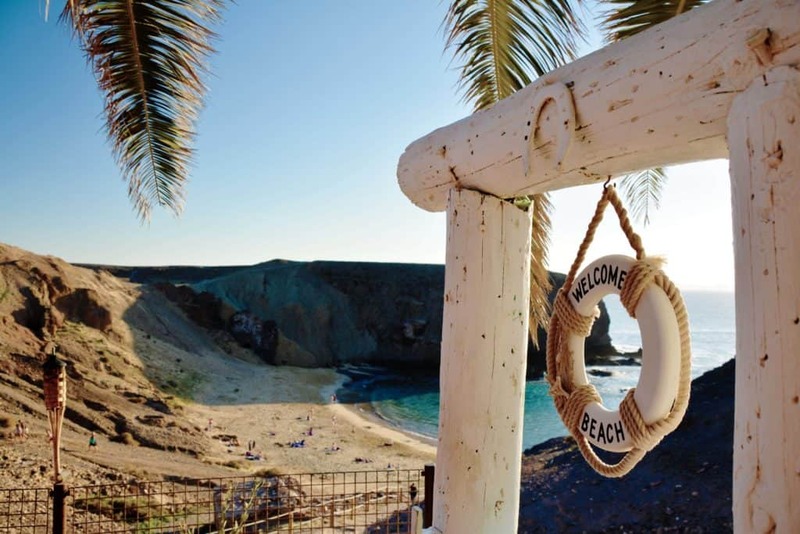 It is also the perfect beach to enjoy before or after visiting one of the centres of interest in the northern part of the island: Mirador del Río, Jameos del Agua, Cueva de Los Verdes etc. 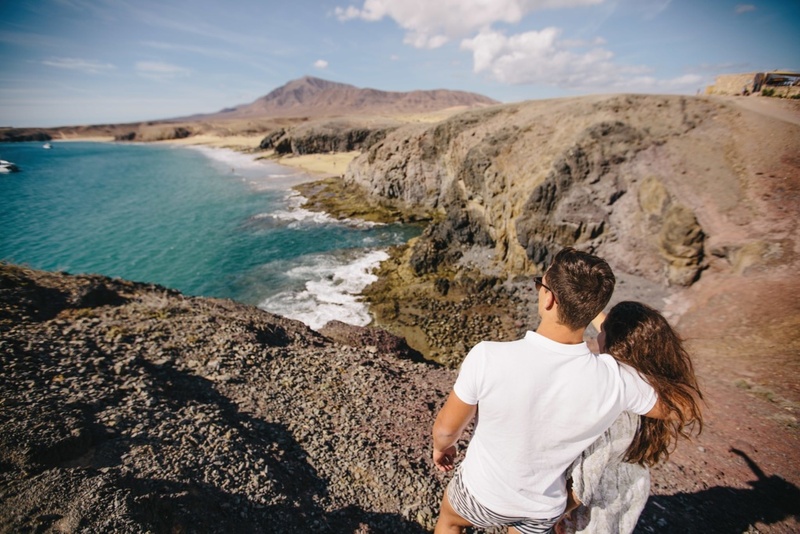 In the south of the island of Lanzarote, close to the tourist area of Playa Blanca, the coast is lined with paradisical beaches that, under the protection of the Monumento Natural de los Ajaches, are located in completely virgin territory. These beaches are isolated from each other by small mountains that delimit them, creating coves of abundant fine golden sand. The clarity of their waters creates a very intense palette of colours. As well as enjoying these wonderful beaches, it is also a good idea to explore the small mountains and contemplate the coastal landscapes offered by Los Ajaches. 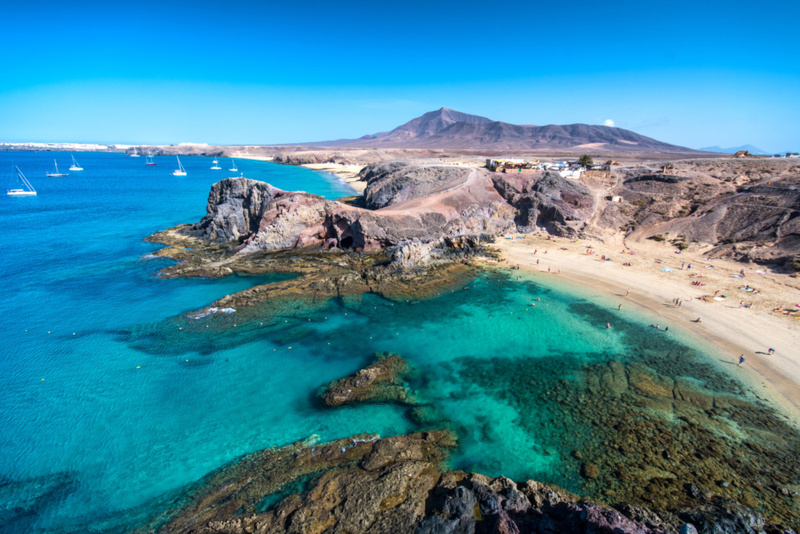 From these beaches you can also enjoy a panoramic view of the Isla de Lobos and Fuerteventura – a natural landscape like this is a treat for the eyes. The natural park has seven beaches: Papagayo, Puerto Muelas, Caleta del Congrio, Playa de la Acera, Playa del Pozo, Playa Mujeres and Calentón de San Marcial, as well as a camping area and a chiringuito (beach bar) located on the beach of Papagayo. It is a good idea to take food and water if you plan to spend the whole day. And don’t forget your diving mask, because the calm waters make this the perfect place for snorkelling. The access is from the eastern zone of Playa Blanca, in the direction of the village of Femés. A signposted dirt track takes you into the heart of this natural area. There is a charge of €3 per vehicle and the fee goes towards the conservation of the space. There is no charge for access on foot or by bike. The coves have parking areas right next to the beach and the access is wide and comfortable. 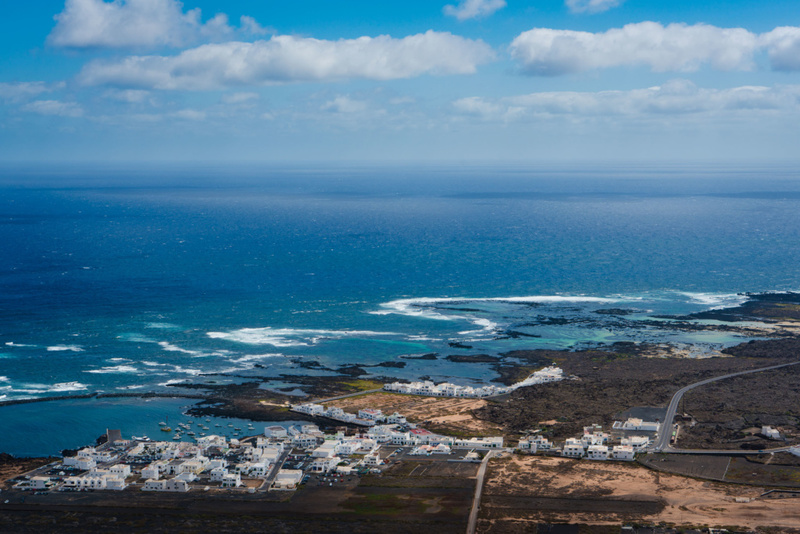 In the southeast of the island of Lanzarote is the tourist area of Costa Teguise, with a very relaxed atmosphere and a warm climate, refreshed by the Atlantic breeze. The area enjoys good infrastructure created for the enjoyment of all types of tourism, and this is an urban space adapted to the environment and which has been developed while conserving that special touch that is characteristic of the local artist César Manrique. The area has wonderful beaches designed to be used and enjoyed by the local residents and tourists. 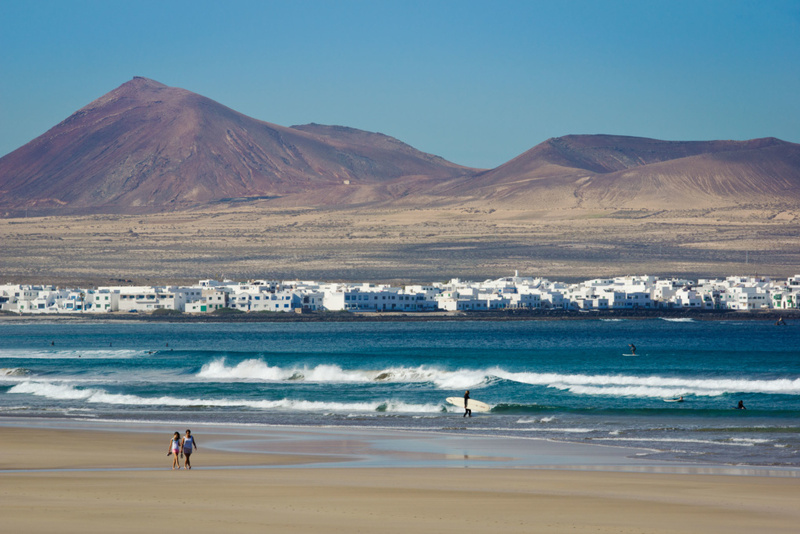 Let’s first mention the Playa del Jablillo located in the central-coastal part of Costa Teguise. This beach has natural protection from the winds and the tides, but it also has a breakwater structure that ensures that it enjoys calm waters all the time. 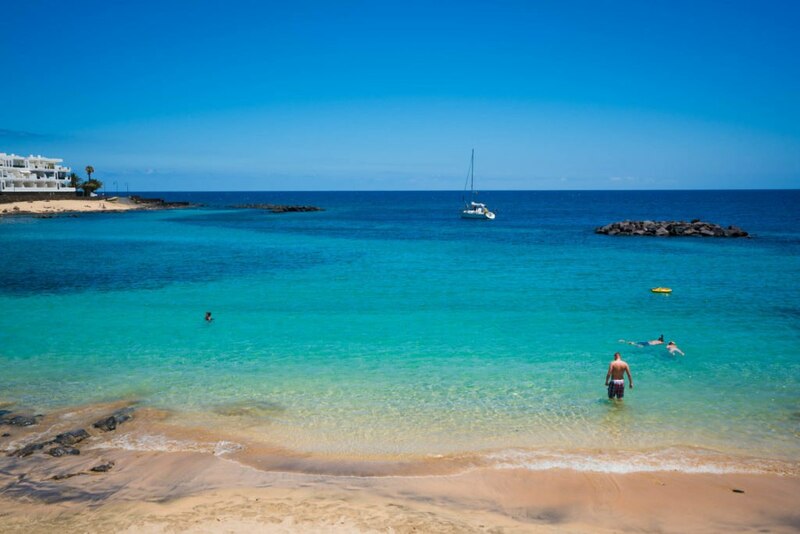 This small cove with its clear waters and white sand is the perfect family beach. El Jablillo is a very well-equipped beach with a sunbed service and showers; it is close to the cafés and shops of the seafront promenade, and also has parking and a nearby guagua stop. It has very good accessibility and has a lifeguard service. 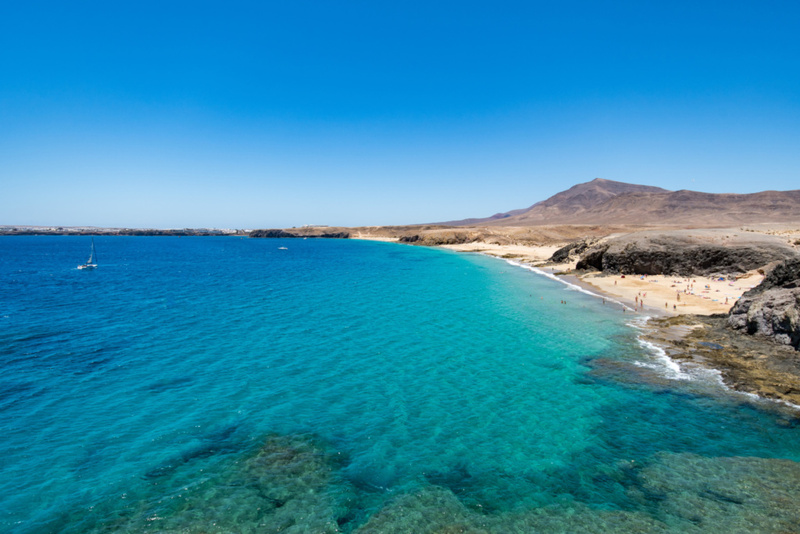 Located to the east of Costa Teguise, the beach of Las Cucharas is the longest in this tourist area. With golden sand and clear waters, this beach has become a benchmark due to its great sporting importance. You can practice sports such as surfing and diving, but windsurfing is the king of the beach due to the perfect wind conditions here. Each year the European Freestyle ProTour holds its championship competition from this beach. Las Cucharas is located right on the seafront promenade, close to shopping areas, restaurants and accommodation. It is also an adapted and accessible beach, equipped with parking, kiosks, guagua stop, leisure and sporting equipment hire, toilets, showers and a lifeguard service. It has a breakwater that ensures calm waters. It is therefore the perfect beach for all kinds of people, families, young people, those who love water sports, adults…. 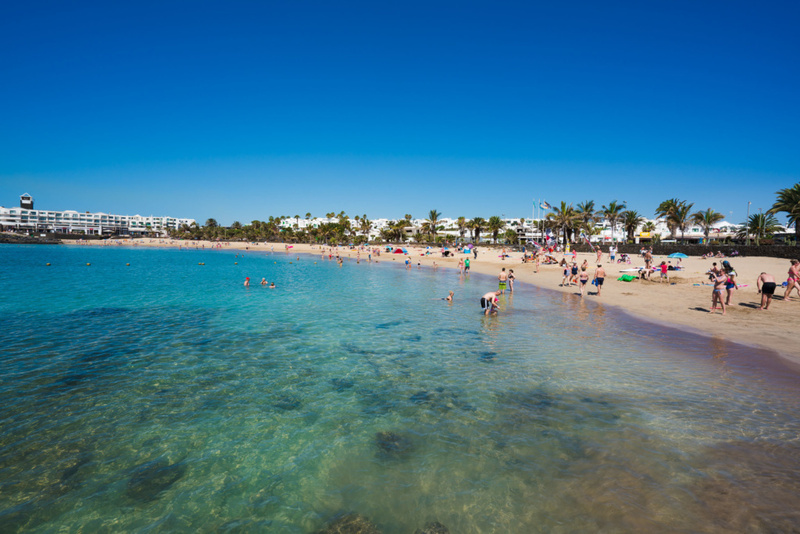 On the western side of the Costa Teguise tourist area is Playa Bastián, a lovely beach with fine dark sand, with garden areas and numerous palm trees that provide shade on hot days. The beach offers small protected areas with low stone walls, and is the perfect beach for spending a day with the family. It has rocky shores, so care must be taken when choosing where to enter the sea, since there are few sandy areas. 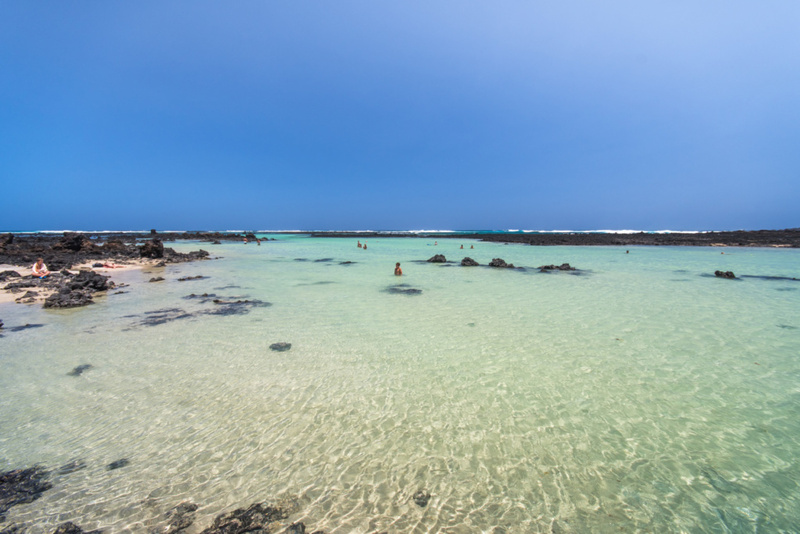 However, the volcanic rocks that make up the shore invite visitors to explore the flora and fauna on the seabed using a snorkel. The beach has a seafront promenade where you can find the few bars, rastaurants and accommodation in the area. There are also sunbed, shower and parking services. The Playa Blanca development is located in the south of the island. This area has a large variety of tourist services and is a pleasant and peaceful zone. Playa Blanca also offers wonderful beaches with clear waters of great natural beauty which offer good services for the enjoyment of all. To the west of Playa Blanca is Playa Flamingo, lying below the hotel with the same name. This is a public beach with white sand and clear waters, perfect for a family day out, since it has breakwaters that protect the beach, providing a feeling of security and calming the waves. It is a well-protected and quiet beach. The beach has parking, signage, showers, bins, accommodation and recreation areas. 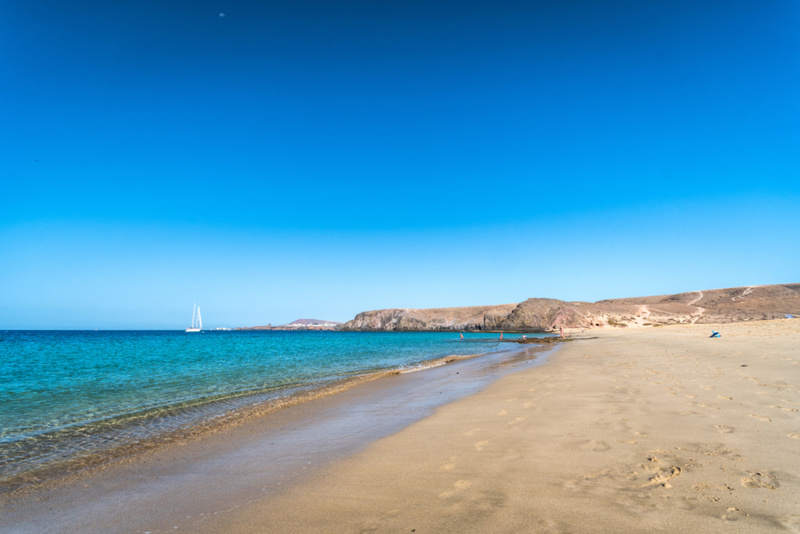 To the east of Playa Blanca you will find Playa Dorada, a semi-artifical beach that is perfect for groups of family and friends. 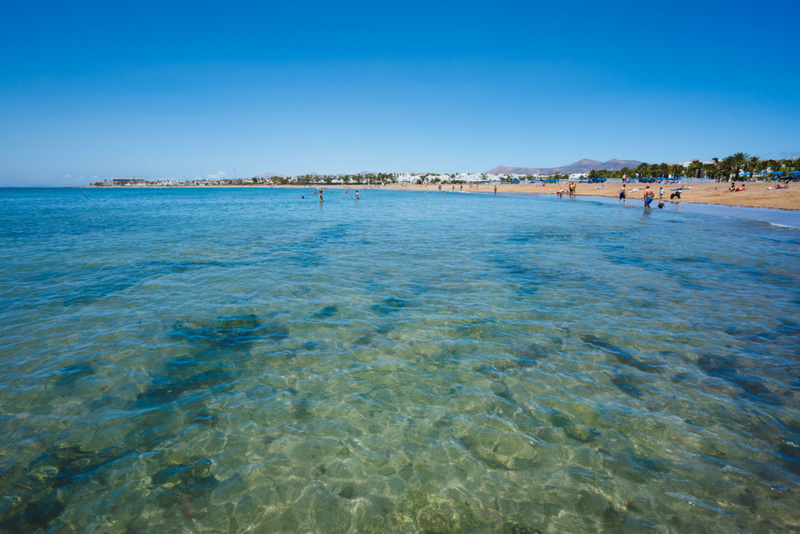 With golden sand and clear waters, Playa Dorada is protected by two breakwaters that calm the waves. The beach offers different sporting activities, such as diving, jet ski hire, water rides, etc. It is a very calm and very well-equipped beach, since the surroundings offer an infinite variety of services. It also offers the following: sunbeds, showers, restaurants, parking, signage, beach bars and bins. There is accommodation in the area plus a seafront promenade that runs all along the beach. It has excellent accessibility since the seafront promenade goes right up to the beach, and there are ramps for visitors with reduced mobility. 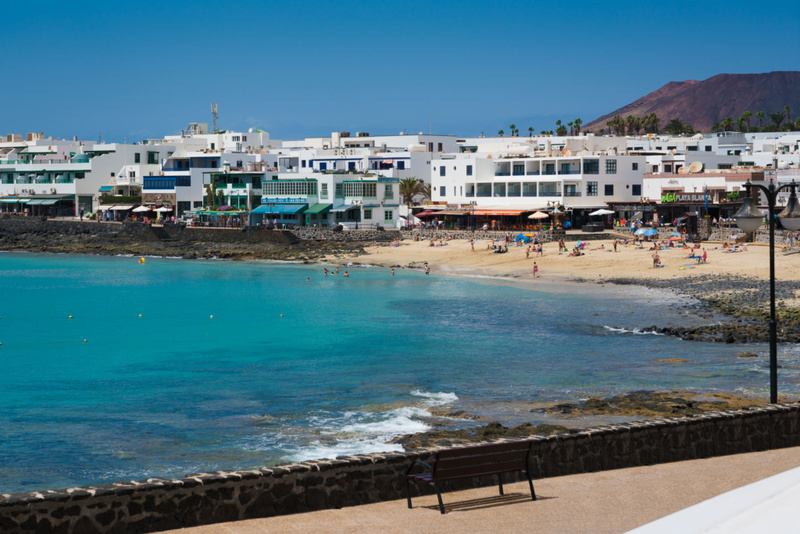 In the centre of the tourist zone of Playa Blanca is the beach that gives its name to the town. 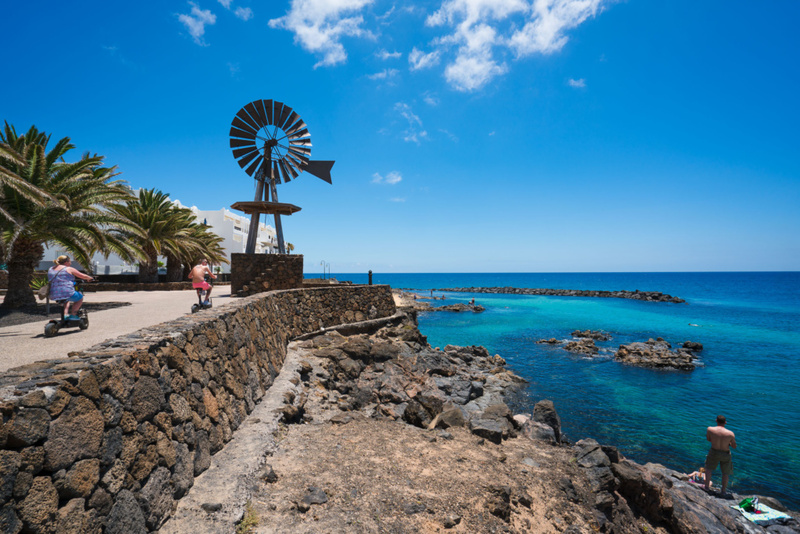 This beach has been awarded the blue flag, and the architecture and colour of the surroundings provide a visual reminder of how villages came to be built on the Lanzarote coast. 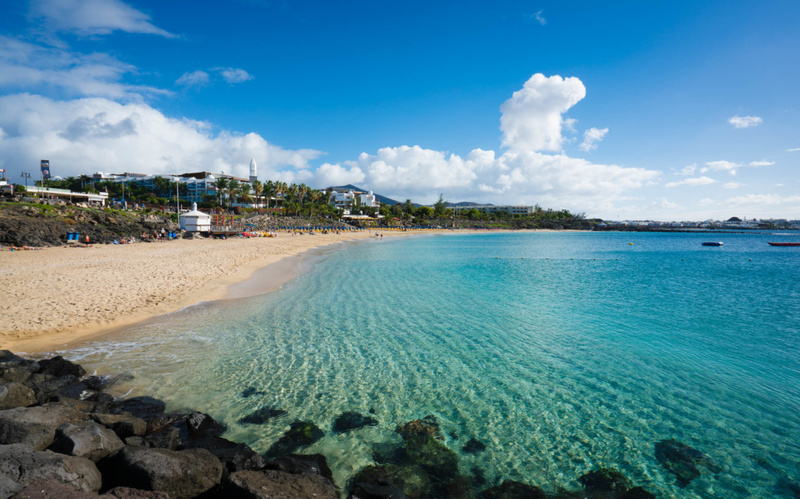 With its white sand and clear waters, this beach is perfect for families. It is a small and welcoming beach, with a seafront promenade that has a full range of shops, restaurants and bars. The beach offers many services, such as sunbeds, showers, bins and sunshades, as well as infrastructure for visitors with reduced mobility. 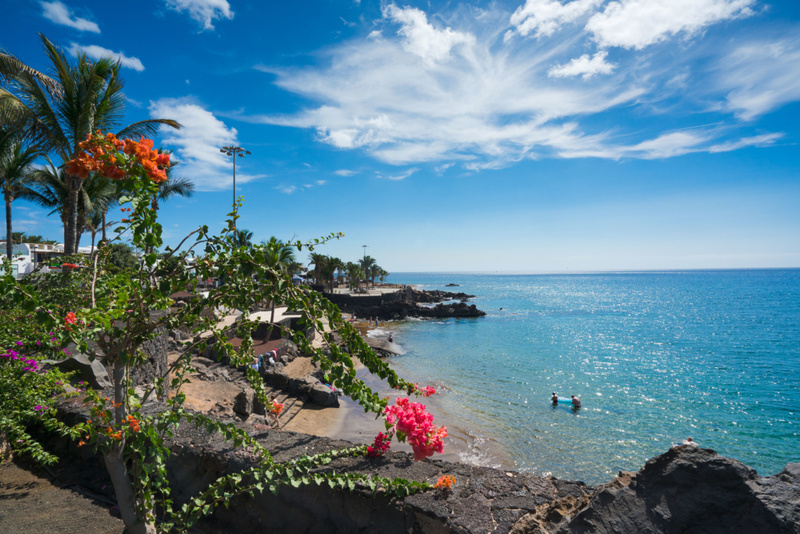 In the central-southern zone of the island you will find the tourist area of Puerto del Carmen. The town is located just ten minutes from the airport, and has a wide offer of activities that meets the needs every kind of tourist. It also has wonderful beaches with crystal waters and burning sand. 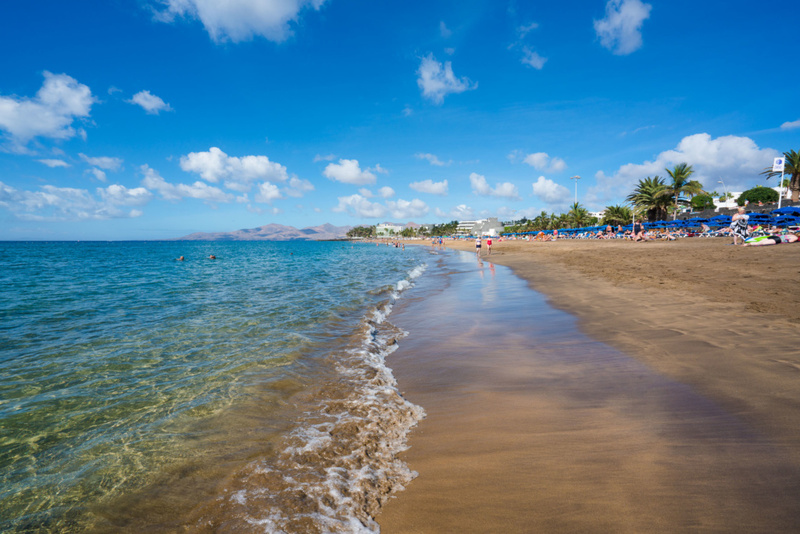 At the far eastern side of Puerto del Carmen is the beach of Los Pocillos, the second-biggest beach in Puerto del Carmen. It is named after the puddles or “pocillos” that are created by the tides. It is the perfect family beach, and has a children’s play area and nearby food and leisure areas. This beach has golden sand and generally calm waters, although sometimes it can be windy. It has lifeguard, sunbed and sunshade services, as well as toilets. 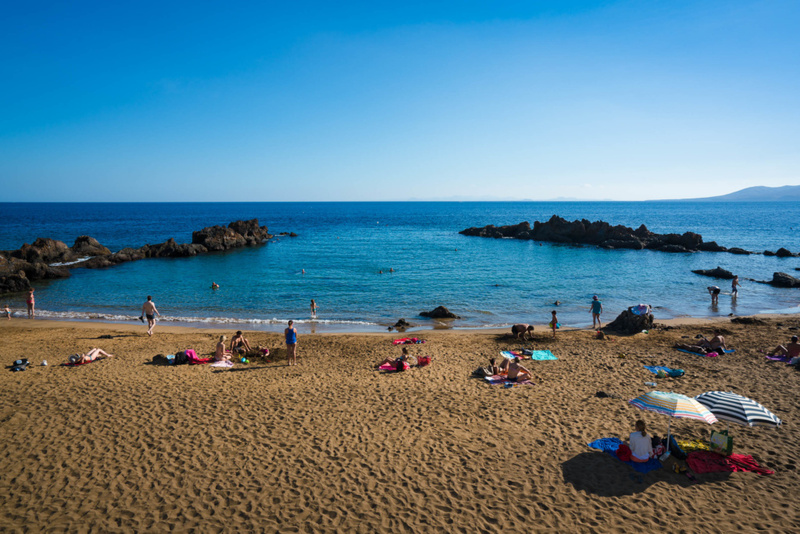 Closer to the centre of Puerto del Carmen you will find Playa Grande. At 1,190 metres long, this beach offers an infinite number of sporting and leisure activities.  As well as being very well-equipped, it has multiple services: sunbeds, parking, signage, promenade, showers, bins, lifeguards, accommodation, toilets and sunshades. 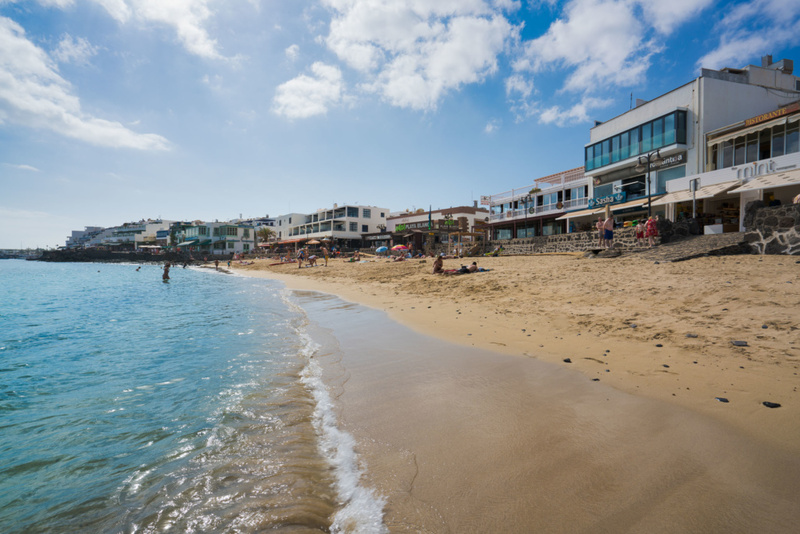 The beach also has a seafront promenade with bars, beach bars, restaurants, discos and shops where you can enjoy the energy of this beach and its surroundings. In the western area you will find Playa Chica, enclosed by lava flows that go into the sea. As its name makes clear, it is a small beach with golden sand and crystal waters, bordered by rocks that give it the appearance of a cove. The beach has a sunbed and sunshade service. This sandy cove is also one of the main diving spots on the island. It has diving schools where you can hire everything you need to enjoy the sport and appreciate the amazing seabed. The beach also has a small pier offering places to eat and leisure activities.